Home Theater Antique Popcorn Popper - 6oz. Home · Bowls & Party Supplies · Commercial Popcorn Poppers · Home Theater Antique Popcorn Popper - 6oz. Product Reviews for Home Theater Antique Popcorn Popper - 6oz. Entertain at home in style with this Professional 6 oz. Popcorn Machine. This is the big brother of the "4 oz" home theater poppers as featured in "Maxim" Magazine and USA Today. 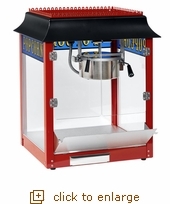 The 6oz popcorn machine can produce 113oz of popcorn per hour and is ideal for use in social clubs, small schools, medium concession stands, small bars, small break areas, and concession stands. * Popping Cycle Time is 3 minutes.